Important Update: It saddens us to report that on January 21, 2019, Munchery meal delivery service closed down its operations after failing to remain profitable and preserve its position in an increasingly competitive market. All outstanding orders will be cancelled and full refunds will be issued to the customers. Unfortunately, it seems that the company is not planning a comeback as of yet, but we will keep you posted in case of any new developments. For some good Munchery alternatives, view our list of the best healthy meal delivery services. Munchery has been around since 2010, when it was founded by a friendly crowd of exhausted new parents who got tired of eating fast food dinners. Whether you are in the mood for a healthy, ready-to-heat meal or want to cook the meal yourself but only have 15 minutes to spare, Munchery has got you covered. Their selection of dishes for special dietary needs is truly impressive, just like every other aspect of their service. 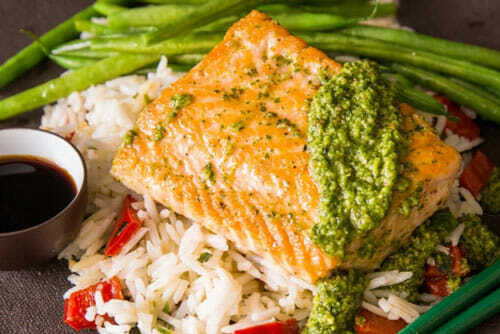 Learn all about this delightful meal delivery service in this Munchery review. Ordering from Munchery is as easy as pick, click, and wait for your delicious food to arrive. You can choose between ready-made meals and cooking kits. You can pick your meals by browsing the offer by a number of criteria, including the main ingredient, cooking method, special diet, and meal type (for more information on the selection of dishes, see the Meals And Recipes section of this Munchery review). At any given moment, Munchery offers dozens upon dozens of options. Once you find something you like, you can find out if it is available in your city by clicking the Check Availability button. You can also see what is on the menu in your place of residence and pick everything you are in the mood for. Munchery takes great pride in offering amazing, professionally cooked meals at extremely reasonable prices. In an effort to make the prices even more affordable, it became a membership-only service in April 2016. Being a member of Munchery comes with numerous perks and practically zero downsides. As a member, you can earn monthly perks, including free food, free delivery, and credits for future orders. If you are worried about committing to a subscription and being stuck with paying for food you do not like, you shouldn’t be. You can skip whenever you want or cancel anytime. This kind of approach truly sets Munchery apart from the rest of the lot. We have already said that ordering from Munchery is super-easy. You go to their website and do everything online, in just a couple of clicks. However, there is another, even easier way to order Munchery food – you can order by using its handy app. Not many meal delivery services offer this option and it is a very useful option indeed. While researching for this Munchery review, we were happy to discover that this company is one of the most generous and caring meal delivery services around. Every time you purchase food at Munchery, 1% of the money you spend goes to the charity of your choice. Not only does Munchery support charities, but it also cares about the planet. Delivering food across the country equals toxic carbon emissions. However, Munchery is bent on doing its part to protect the planet. The packaging this company uses is completely recyclable. On top of that, it plants trees through The Conservation Fund in order to reduce its carbon footprint. With Munchery, you can send a gift of love to anyone who may appreciate it. If you know someone who could use some time away from the kitchen, you can invite your mutual friends to pitch in and send a group gift. You can also send an individual gift card, buying someone as many meals as you wish and allowing this person to order them at any time. These are only some of the uniquely wonderful features of this meal delivery service. 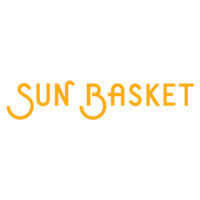 Others include the unbelievable variety of the dishes, super-convenient cooking kits, and its ever-changing menu. Read more about them in the following sections of this Munchery review. Some meal deliveries rotate their menus weekly, some do it every couple of weeks, and some do not seem to change them at all. 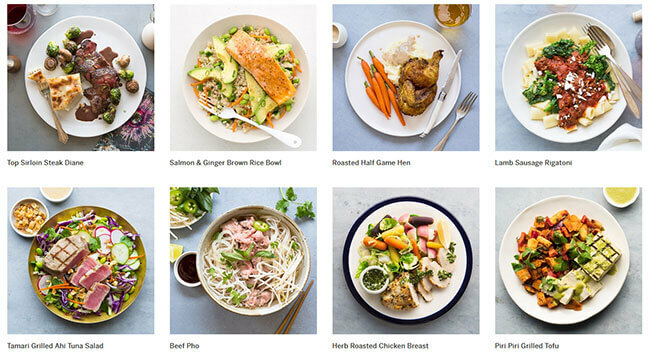 Munchery changes its menu every day, making sure you have something new to try out every time you stop by. As we have already mentioned, you can take a look at the meals on the menu in your city or browse Munchery’s offer by categories. These include Meal Type, Cuisine, Cooking Method, Special Diets, and Main Ingredient, as well as popular meals in major cities and states. When it comes to meal types, you can choose from dinners, side dishes, desserts, breakfasts, meal kits, and even beverages. Special diet options include vegetarian, vegan, gluten-free, dairy-free, nut-free, egg-free, antibiotic-free, organic, and Paleo. You can have your food fried, seared, braised, baked, grilled, sautéed, raw, marinated or steamed. You can choose from around 30 cuisines, including Mediterranean, Mexican, Thai, Cuban, Cajun, Filipino, Indian, and many others. The list of main ingredients goes on forever and you can even browse by ingredient alphabetically. You can also order kids’ meals for your little ones. Spoilt for choice is an understatement when it comes to Munchery’s offer. No matter what food you love or want to avoid, which cuisine you prefer or which cooking method is your favorite, you can find something you like on Munchery’s menu. Finally, a word or two about the wonderful cooking kits. Some companies offer pre-measured ingredients and recipes that enable you to cook a meal in just around half an hour. Munchery offers pre-measured ingredients that are also chopped by pro chefs and allows you to prepare amazing meals in just 15 minutes. Once again, Munchery 1, competition 0. So, we have established that Munchery is awesome. But how much do the meals cost? Not too much, actually. Ready-made dinners start at just under $10 but can cost up to $18 if you pick a true haute-cuisine dish. The prices of sides, salads, and desserts normally range from $4 to $8. Meals for kids usually cost from $4 to $6. As far as subscriptions are concerned, the prices start at $51.95, which buys you 2 dinner kits, each one for 2 people. Delivery costs $3 to $5 for same-day deliveries and the cooking kits come with free delivery. We have mentioned in this Munchery review that in order to purchase meals from Munchery, you need to become a member. The price of membership is $8.95 per month and it allows you to save a lot of money on your orders, with various discounts and monthly perks. Until recently, Muchery delivered its ready-made meals to only around 1,000 cities in 15 US states. Now, the service ships its chef-prepared goodness to over 5,000 cities, from coast to coast. 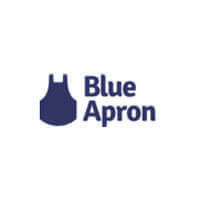 Its delivery map currently includes more than 40 million households across the country and you can easily check whether the meals are available in your area by entering your zip code on the company’s website. 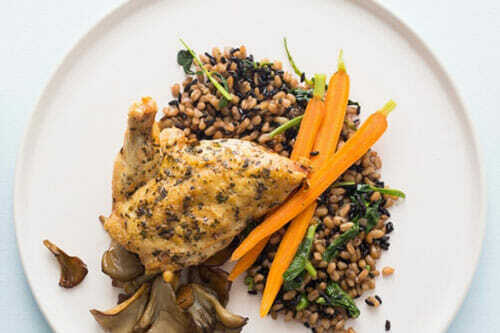 If Munchery does not ship ready-made meals to your zip code, that does not mean you cannot enjoy its lovely food. You can still receive its cooking kits every week and cook great meals for 2 in just 15 minutes. To make sure Munchery meets all your standards and expectations, it is important to know its biggest advantages and disadvantages. With a short overview of its pros and cons, you can easily decide if Munchery is the right meal delivery service for you. If you subscribe to Munchery, you can easily prepare culinary masterpieces using only the ingredients and recipes found in your meal kit box. You may not be a pro chef just yet, but with Munchery, you can easily make restaurant-grade meals. You don’t have to take our word for it – check out the images below to get a better idea of the types of dishes you can enjoy with Munchery. Munchery has it all. From amazing variety, special diet options, discounts, and gifts to the ultimate cooking kits. It offers food for all tastes and preferences and more options than you can imagine, including every possible meal type and even beverages. It even donates money to charities and helps protect our planet from pollution. The only downside is that its ready-to-heat meals are not available nationwide. However, even if you do not live in an area where Munchery delivers its prepared meals, you can always order its cooking kits. All in all, Munchery is definitely one of the meal delivery services you should add to your must-try list. Our ratings are the result of an objective and independent evaluation of Munchery, generating the final rating that reflects the overall quality of the company. Ratings may change as the service changes. Munchery customer rating based on 4 customer reviews. I checked out Munchery website because Michael Finney from 7 On Your Side had a free dessert coupon for them. After looking at the choices I decided not to move forward and left the site. Imagine my surprise when I couple of days later I heard a thump on my BACK porch and opened the door to find a delivery from Munchery. I was able to grab the box and return it to the driver, telling him I had not made any order. THEN I looked at my Credit Card statement and found that I'd been charged $57.95. Am wondering how the HELL did they get my card number when I didn't fill anything out?? BEWARE!! The. best. 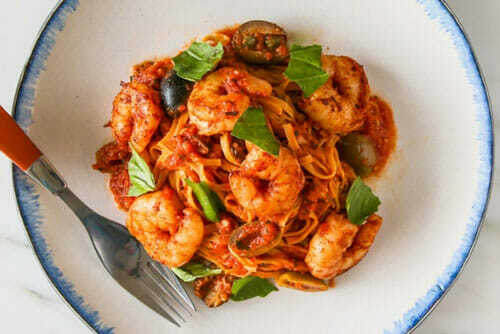 meals. ever. Honestly, cannot praise them enough, will be ordering forever. Possibly the only meal delivery service of this kind that offers same-day deliveries. Be sure to try the famous steak au poivre. Pricy as hell, but sooo worth it. 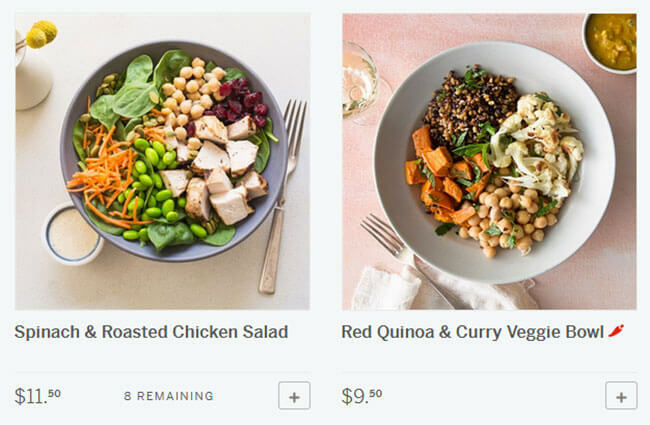 We found 0 verified Munchery discounts for April, 2019. There are no Munchery coupons or discounts right now.